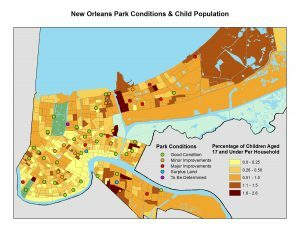 The purpose of this project was to examine New Orleans Recreation Development Commission (NORDC) parks in relation to child population and household income. This project was part of my internship with the City of New Orleans Innovation Group who wanted to collect data on all active NORDC parks to evaluate where funds can be best spent to improve the parks for the citizens of New Orleans. This project had two objectives. First it was to examine New Orleans Recreation Development Commission (NORDC) parks for the city to see where funding was needed most for park improvements. Second, I used the data collected to compare park quality against household income and child population demographics across the city. On April 25th, 2015 the small landlocked nation of Nepal was hit with a 7.8 magnitude earthquake. The aftershocks that happened in the month that followed contributed to further loss of life and hindered recovery efforts. The following maps were created as a final project for my GIS course at the University of New Orleans. It maps the earthquake focus point and recovery efforts per district with data available through humdata.org.